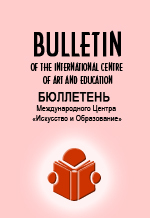 The online scientific and methodological journal «BULLETIN OF THE INTERNATIONAL CENTRE OF ART AND EDUCATION» provides art pedagogy professionals the ability to publish their scientific and methodical work. The editors accept only relevant specialization of the journal materials, such as history and theory of art, art pedagogy, teaching methodology of art education and related areas of knowledge. 5.improvement and development of modern methods and art-teaching technologies in extra curricular education, general education and vocational training. All of articles publishing in the journal are available on the website www.art-in-school.ru. The journal is not responsible for the authenticity of the author’s text in the articles or actual materials and correct citations. The decision for publishing or rejecting the submitted material is made based on the reviewing regulations. The Journal reserves the right to make changes to the submitted materials, to shorten the text, to reject thematically inappropriate or not properly edited manuscripts, according to the rules of editorial ethics. Rejected materials can not be reviewed and can not be returned. By sending the article to the editor, the author agrees to publish it in the online scientific and methodological journal «BULLETIN OF THE INTERNATIONAL CENTRE OF ART AND EDUCATION» to place it on the journal's website in the Internet, to transmit the text of the article to third parties (the provision of data is necessary), in order to promote citation and to increase the index of quoting the author and the journal. The author point of view does not necessarily reflect the position of the editors. The authors are entirely responsible for the authenticity of the information, quotes, links and bibliography. Approved permissions to reproduce material of the journal should by issued in writing, otherwise it’s not allowed. Articles for publication are submitted by e-mail address: Kushaev38@mail.ru. Editors necessarily confirm receipt of manuscripts. In the case of not receiving the notification within seven days, please duplicate the sending of the materials. The sending material is registered by the editorial staff with an indication of the receipt date, the author / authors name, work place, contacts, the article title. The editors are ready to cooperate with the authors whose materials contain the results of independent research, if the subject is in the range of the journal’s area of interest. Submissions should not have been published previously in other journals. The article should be framed with the requirements below and proofread by the author. 1.Technical parameters of the article. The text is typed in Word: font size - 12 Font Headset - Times New Roman, line spacing - 1, margins - 2 cm on all sides. The text length should be up to 15 pages, including abstracts and references (30,000 with spaces), up to 10 pages (20,000 symbols) for postgraduate students, but not less than 15,000 symbols. 2. The structure of the article. The material should contain the following elements: indexes UDC and BBK, the title of the published material, abstract, keywords, text, published material, a list of sources and literature, information about the author / authors; article title, abstract, keywords and author information should be presented in the Russian and English languages. 3.The titles of scientific articles should be informative, concise and represent the essence of the material thematic content. Translated title of the article in English should not be a transliteration from the Russian language, except for proper names, untranslatable names, instruments and other objects that have their own names. Abstract in Russian should be designed in accordance with State Standard 7.9-95, State Standard R 7.0.4-2006, State Standard 7.5-98 with volume of 100-250 words (according to the State Standard it has 850 signs and not less than 10 lines). It is placed after the title and author’s/authors’ name. It should represent the structure of the article (urgency, the main objective, the issues addressed, sections of the paper and the methods used (if relevant to the article), the conclusions), and to be informative. Abbreviations and signs, in addition to general meaning, are used in exceptional cases, or give their definitions at the first use. Abstract in English (summary) performs for the English-speaking reader a reference tool and carries a function to conclude the main source of information about the article. It should be done in a high-quality English language, using accepted and understandable terminology for English-speaking readers. Key words are 5-10 basic terms to reveal the publication content and have direct relevance to the objective and scientific evaluation of its concepts and ideas. Keywords are the structural basis of the publication the interested reader would be able to find quickly. The key words present in the nominative case. Sources and References should include all the works used by the author; Editors endorse links to the latest scientific literature. Each reference should include the following items: the author / authors, title, place of publication, year of publication, publisher, number of pages. Also the editor, compiler, translator, etc. ; and the Book Publishing Series, if it is available. In the description area the separation mark "dot and dash" should be placed. The list of references should be put together in order of citation (!) and should be issued in accordance with State Standard 7.1-2003 "Bibliographic record. Bibliographic description. General requirements and rules". References in the text are marked by square brackets as they become ordinal numbers. A link to the page is separated from the reference to the source point. If the square brackets at the same time contain links to several sources, they could be separated by a semicolon (for example: [1, p 25.] or [1, p. 26; 5, p. 17]). Links to Internet-resources should be represented in the general list of literature by author or publication title, with the obligatory indication of the website address, and the date of its location or the date of the last check resource. The author is responsible for the information authenticity and the authenticity of quotations and references to sources and literature. Information about the author / authors (in Russian and English) should contain the name, surname and patronymic (in full), place of work, indicating the department (no abbreviations, acronyms are not allowed, it is recommended to use conventional translation as an organization name), position, academic rank or status, academic degree, name of the country (for foreign authors), e-mail address. Editors request to provide the phone number (preferably a mobile) and home address with postal code (this information will not be published) to work with the authors. The names of the authors of articles in transliterated form should conform to author's profiles, available in the database in order to facilitate the identification and integrating the data about their publications and citation under one profile (with author’s ID). Moreover, it is important for authors to keep specifying one place of work, as the data on the affiliation with the organization is one of the crucial sign for author’s identification. Registration of tables, figures, formulas. Each table in the text should be referred and named. Illustrations (photos, drawings, schemes, graphs, diagrams, maps) should be submitted as a separate file in TIF or JPG format with a resolution of at least 300 DPI. Vector formats (AI, EPS) are also possible. The text should contain links to the illustrations that are numbered and accompanied by captions. The main text of the article may contain notes in the form of automatic footnotes, with continuous numbering. Articles, sent to the Editorial office without compliance with these conditions, will not be accepted. For publication in the online scientific and methodological journal «BULLETIN OF THE INTERNATIONAL CENTRE OF ART AND EDUCATION» the editors accept scientific articles containing the main results of research conducted by the author / authors, scientific reviews, the deliverables of scientific events (symposiums, conferences, seminars, and so on), ratings. The Editors reviews all of incoming corresponding to its category materials. All of reviewers are experts in the subject of reviewed materials and have reviewed article theme publications for the last 3 years. Received materials are recorded with indicating date, name of the author / authors, place of work, interact contacts, name of the material, with a unique registration number. The editors accept the material, if it is designed in accordance with the provided requirements. Please, check before sending the material for review on the "Anti-plagiarism" software. High level of borrowing detection entails rejection of the material. The editors send the manuscript for review to a member / members of the Editorial Board. In case of the controversial material or article for admission of the Editorial Board member, the Editor in chief (deputy editor) sends the material for review by external reviewers. The journal follows the rules of double "blind" (anonymous) review. Interaction of authors and reviewers is implemented only through the editorial staff. The editorial staff reserves the right (in agreement with the author) of reducing the volume of material and literary editing, as well as the refusal to publish (according to the review of editorial board members), if the article does not conform to the profile of the journal or it has quality problems in material presentation. Manuscripts rejected after reviewing are not examined once again. In case of article rejection the editorial board sends to the author a reasoned refusal. The Editorial Board recommends using the traditional form of reviews. The review represents the relevance of the topic, the originality of its disclosure and its theoretical significance or application, the validity of the findings by the authors, correlation with well-known scientific and methodological approaches, correct using of mathematical apparatus. The editors also note the personal author / authors contribution in the decision of the designated problem, consistency and availability of presentation, correct use of the attracted resources. It is given 20 days to considerate the material. Reviews are sent to the editor by e-mail address: Kushaev38@mail.ru. Reviews are stored in the Editors for 5 years. After receiving the necessary review, the Editorial board takes the final decision about the publication or refusing to publish materials. Editors informs the authors about the decision on request. Editor in chief (deputy editor) coordinates the work of editors, signs the current issue for printing and gives permission to publish online. If the Editors recommends finishing off the material, The Board sends reviewers to the author / authors without referees data. The modified article sends for review together with its original version as soon as possible. Article delayed for more than three months or submitted for finishing off is regarded as a new material. If it is necessary, The Editorial Board has the right to involve for reviewing more domestic and foreign experts, the scientific status corresponding to that position. The rejected manuscripts are not considered again. Other articles of the failed authors are accepted for consideration on general grounds. In the case of a negative assessment of the reviewed material, and inappropriate recommendations for publication in the journal reviewers give a detailed justification of their own findings. In case of disagreement with the reviewer opinion, the author has the right to apply to the Editor with the reasoned request to direct his manuscript for review by another reviewer. In this case, the Editorial Board sends the manuscript for re-review, or gives a reasoned refusal to the author. The Editorial Board does not consider manuscripts, previously published in other scientific journals. The fee for the review is not charged.